Anyhow, enough about those winter blues because I'm dreaming of spring! These warmer temps we've currently had are making me so happy. I can't wait for open-toe sandals, sun dresses, and all the beautiful flowers that are about to make their annual debut. Spring is my favorite season and I think it's partly because of all the beautiful flowers. 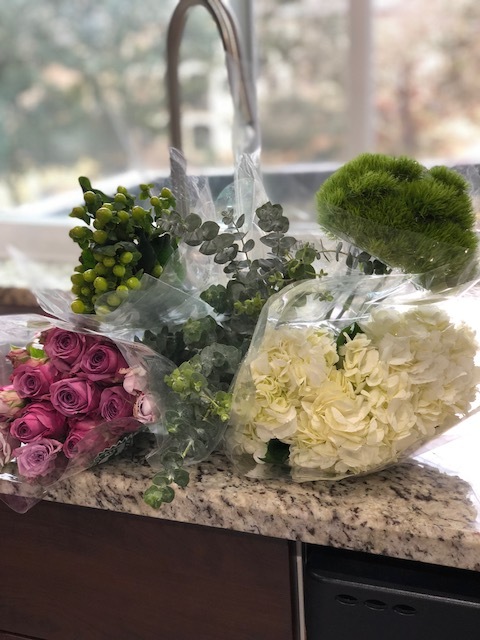 Whether you pass them on the street, or pick them up at your local farmer's market, a pretty bouquet is an instant mood brightener. After hot yoga the other day, I ran into Trader Joes and picked up some various blooms. I love to keep fresh flowers in the house as often as possible. The bouquet that I arranged was so easy and came out much better than I expected. Drop a comment down below and let me know if you'd like to see a post on how to arrange a quick and easy bouquet.